June 6, 2016 – Today, our time machine heads back to our show’s past, serving up a special, all-new paperback interview with a familiar voice. Back in August of 2015, we kicked off the show with the words, “Three mules, two brothers, and a Jack Russell terrier named Olive Oyl.” Our guest was Rinker Buck, and his book — The Oregon Trail: A New American Journey — recounted the trek he made with his brother Nick in a covered wagon, two thousand miles from Missouri to the great American Northwest. 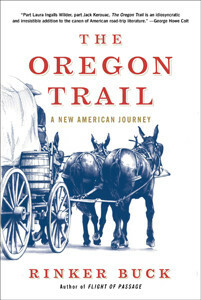 In the months since hitting shelves, The Oregon Trail has wended its way up the New York Times best-seller list to #1, and Amazon.com named it the best non-fiction book of 2015. When completing the first mule-powered crossing of this legendary pioneer trail in over a century, Rinker met a lot of people — and he met them, in a new light, after they’d had a chance to see the enthusiastic response to how he shared their story. With the paperback edition of The Oregon Trail appearing in bookstores June 7, 2016, we thought, why not bring Rinker back to hear about his experiences on the tour following publication. After all, he only set out to write a book. But his pen sparked a national phenomenon, which you can share by visiting Facebook.com/RinkerBuck. Other books discussed on this episode include: Flight of Passage, by Rinker Buck. The Road from Coorain, by Jill Ker Conway. A River Runs Through It and Other Stories, by Norman Maclean. Young Men and Fire, by Norman Maclean. Angela’s Ashes, by Frank McCourt. America Revised, by Francis FitzGerald. Lies My Teacher Told Me: Everything Your American History Textbook Got Wrong, by James W. Loewen. Also, we mentioned William L. Shirer’s five books on Nazi Germany.